He will always protect her! THE CYBORG’S SECRET BABY is very intense, and very emotional. There is a lot of action, with several unexpected turns of events. Stealth is a wonderful being, he will protect his human female at all costs, and Zebrina might be small but she’s a ferocious warrior in her own way. Cynthia Sax’s prose is always very eloquent, but in this book the visuals are astonishing, and it would make a fantastic movie. 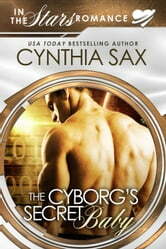 THE CYBORG’S SECRET BABY is everything we expect from Cynthia Sax and more!